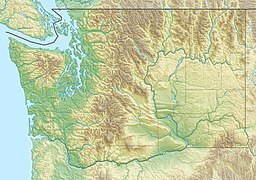 The Black Buttes, also known historically as the Sawtooth Rocks, make up an extinct stratovolcano in the Cascade Volcanic Arc in Whatcom County, Washington, United States. Glacially eroded remnants of this volcano rise above the Deming Glacier, part of the glacier system of the nearby volcano Mount Baker. There are three major peaks — Colfax, Lincoln, and Seward — which can all be climbed. The volcano was last active during the mid-Pleistocene from 495,000 to 288,000 years ago. Mount Baker, a much younger volcano, sits on top of lava erupted from Black Buttes Volcano. The Black Buttes represent the remains of a large stratovolcano that once resided in the approximate location of its neighbor, Mount Baker. Black Buttes lies about 1.9 miles (3 km) from Baker, between Baker and the middle fork of Nooksack River, located in Whatcom County, in the U.S. state of Washington. The volcano reaches an elevation of 9,373 feet (2,857 m). Its peaks lie next to Coleman Glacier, Thunder Glacier, and Deming Glacier. These peaks include the two principal summits, East Butte, or Colfax Peak, and West Butte, or Lincoln Peak, as well as the third major mountain crest, called Seward Peak. First climbed by David Anderson, Clarence A. Fisher, and Paul Hugdahl in 1921, Colfax Peak or East Butte, reaches an elevation of 9,373 feet (2,857 m). It has a small ice cap on its eastern side, along with a hanging ice cliff on its northern flank, and it consists of extremely steep rock walls. The route up this summit traverses easy slopes, starting at the Mount Baker saddle from the Coleman Glacier Route, and running for about an hour along a lava ridge or snowslopes. The peak's northern flank was first ascended by Ed Cooper and Fergus O'Conner on May 4, 1958, and demanded ice screws. The western side of the northern flank was first climbed by Paul Johanson and S. Reilly Moss in September, 1974, close to the 1958 route, and the trail there lasts for approximately four hours. Located 0.7 miles (1.1 km) west of Colfax Peak, Lincoln Peak, also known as West Butte, has an elevation of 8,842 feet (2,695 m). It was first ascended by Fred Beckey, Wesley Grande, John Rupley, and Herb Staley on July 22, 1956. The southwestern face can be climbed, and it is accessible by following the cirque on Thunder Glacier from the Heliotrope Ridge Trail, and then rappeling. The climb is technically demanding, lasting 9 hours, and it has significant rockfall hazards. The cirque can also be accessed from Middle Fork Nooksack River Road. The least accessible of the Black Buttes summits, Lincoln Peak has a 1,000 feet (300 m) northern face as well as a 1,500 feet (460 m)-long face to the east. To the west, Lincoln Peak drops into Thunder Glacier's cirque; its southern side features gullies and ridges. Seward Peak has an elevation of 7,825 feet (2,385 m), and it lies 0.7 miles (1.1 km) to the west of Lincoln Peak. First ascended by Dallas Kloke and Bryce Simon on July 11, 1973, it does not require a technical climb. Climbers are recommended to approach as though intending to climb Lincoln Peak, but instead to follow heather to the southwestern ridge before ascending a ridge to a false peak. After another 100 feet (30 m) of ascent, they should reach the summit of Seward Peak, the entire trip lasting about 4 hours. Black Buttes is an extinct volcano with an amphitheater shape. It consists of jagged peaks that form an arc-shaped ridge, which were shaped and altered by glacial motion and erosion. Part of its amphitheater and its main eruptive crater is currently taken up by Deming Glacier, the rest of the volcano sitting above the glacier. Black Buttes was active during the mid-Pleistocene from 495,000 to 288,000 years ago, producing viscous, andesitic lava flows with a steep dip (the steepest angle of descent of a tilted bed or feature relative to a horizontal plane) that reach thicknesses of up to 1,950 feet (590 m), though they were could actually be larger as they are covered by ice. Its most active eruptive period took place between 350,000 and 330,000 years ago. During the construction of its main edifice, at least four flank eruptions from satellite vents separate from its central crater generated lava flows. The first three eruptions produced andesitic flows, while the fourth and most recent event yielded lava composed of basaltic andesite. Andesite from the Lava Divide era, the first and longest eruptive period which spanned 460,000 to 296,000 years ago, probably produced a large volcanic cone, but it has now been reduced to a ridge. Lava flows made of andesite from 455,000 to 366,000 years ago were generated from a vent now buried under Mount Baker; at least two have subhorizontal columns indicating that they were settled adjacent to ice, likely from a glacier. Some of the lava flows also contain hypersthene basalt. In addition to these eruptions traced to Black Buttes, there are five lava flows in the vicinity for which geologists have failed to pinpoint the source vent. These deposits were erupted after Black Buttes went extinct, but before Mount Baker became active. They consist of rhyodacite (dated to 199,000 years ago) and basaltic andesite. The Black Buttes were named by Edmund T. Coleman during his ascent of Mount Baker in 1868. He named Lincoln and Colfax Peaks, describing them on August 14 of that year as "black, jagged, splintered precipices." Historian Charles Easton referred to the Black Buttes as a "homogenous mass of black basalt", comparing them to "a Chinese wall". Historically, the surveyor Thomas Gerdine called them the Sawtooth Rocks, a name which was used for a number of maps. ^ a b c d e "Colfax Peak". Geographic Names Information System. United States Geological Survey. Retrieved 2015-08-18. ^ a b Wood & Kienle 1992, p. 155. ^ a b c d e f Beckey 1995, p. 38. ^ a b "Seward Peak". Geographic Names Information System. United States Geological Survey. Retrieved 2017-12-22. ^ a b "Lincoln Peak". Geographic Names Information System. United States Geological Survey. Retrieved 2017-12-22. ^ a b c d Beckey 1995, p. 38–39. ^ a b c d Beckey 1995, p. 39. ^ a b c d e "Black Buttes – 495,000 to 290,000 years ago". Volcano Hazards Program. United States Geological Survey. 2013-05-15. Retrieved 2017-12-22. ^ "Black Buttes". Geographic Names Information System. United States Geological Survey. Retrieved 2015-08-18. ^ Harris 2005, p. 353. Beckey, F. (1995). Cascade Alpine Guide: Rainy Pass to Fraser River. The Mountaineers Books. Harris, S. L. (2005). "Chapter 20: Mount Baker". Fire Mountains of the West: The Cascade and Mono Lake Volcanoes (Third ed.). Missoula, Montana: Mountain Press Publishing Company. ISBN 0-87842-511-X. Wood, C. A.; Kienle, J. (1992). Volcanoes of North America. Cambridge University Press. ISBN 0-521-43811-X. This page was last edited on 17 March 2018, at 10:21 (UTC).